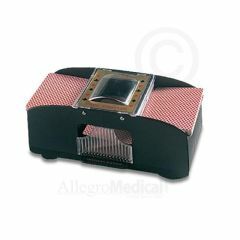 The Battery Powered Card Shuffler eliminates the need to shuffle cards by hand, a job sometimes made impossible because of weakness, pain, and/or poor coordination. The shuffler takes one or two decks of cards and shuffles them evenly by simply pressing down a lever. The cards are collected in a center bin and are withdrawn by pulling out the slide. Requires two "C" size alkaline type batteries. Please Note: Batteries and cards not included. Great for one-handed ppl. Elderly.